Rotherham were nine minutes away from ending their wait for a Championship away way, but in the end had to settle for a 1-1 draw at Blackburn. The Millers looked like securing their first win on the road at this level in 34 games when Michael Smith nodded them in front at Ewood Park in the 75th minute. But Bradley Dack ended their fun just six minutes later to earn Rovers a deserved draw. Still it is a third successive away point for Paul Warne's side and a fifth game without a defeat overall. 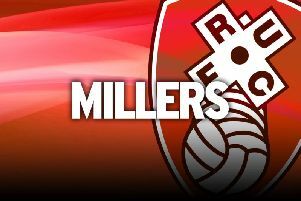 The Millers had to rely heavily on goalkeeper Marek Rodak, who saved an early one-on-one duel with A'mari Bell. Joe Mattock headed a golden chance over for Warne's men, who were almost made to pay when Adam Armstong crashed an effort into the crossbar just before half-time. Rovers ramped the pressure up after the break and laid siege on Rotherham’s goal. Rodak pulled off a double save from Elliott Bennett and Danny Graham, who then had a header cleared off the line, while the Slovakian keeper was again the hero to deny Dack. Then the Millers had hope of ending that long wait when Smith headed home Ryan Williams' deep cross to open the scoring against the run of play. Rovers needed just six minutes to level though, as in the 81st minute Dack tapped home Ben Brereton's cross to break Rotherham's hearts.